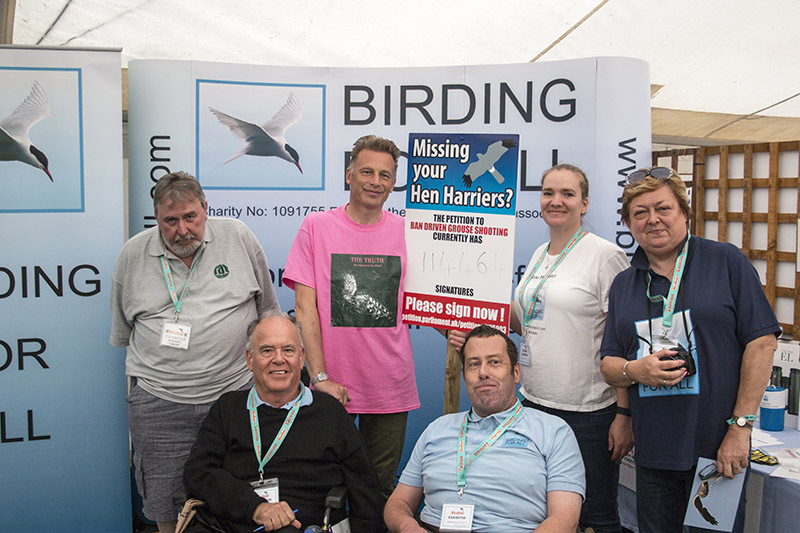 The 2016 British BirdFair was a great success for most attendees, at Birding For All however we had more of a mixed bag. Our regular raffle ticket sales, although down on 2015 still did very well, and membership sign up was at an all time high. We had our old friend Brian back on the stall for much of the weekend, but sadly lost Bo and Maggie half way through the weekend, due to untimely illness. 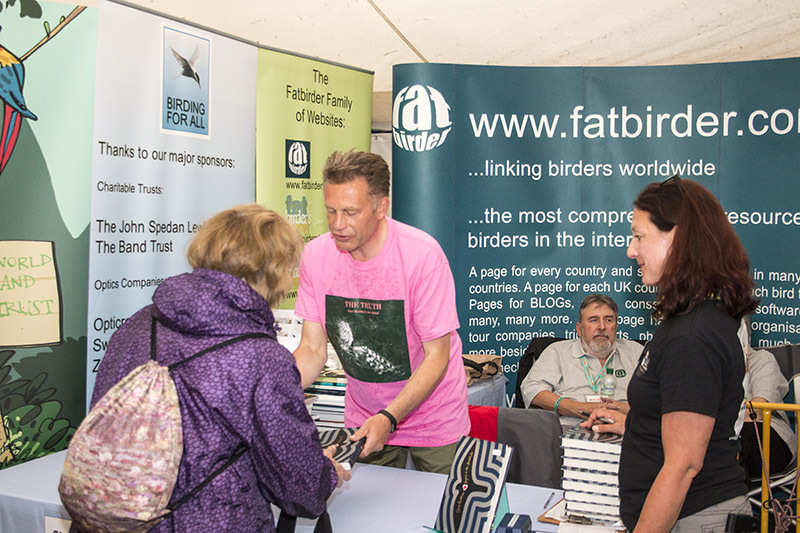 This year at the 2016 British Birdfair we had an extra special event as well, as the legendary TV present, conservationist, author and patron, Chris Packham, had his first book signing of the 3-day event on our stand! Not only did he hot foot it straight to us from a plane but the crowds he drew really helped us to up our presence, and get our stand some much needed attention. Chris we are immensely grateful to you. Garin Baksa and Christine Percy both work for optics companies that have been supporters of BFA from its earliest days. Garin is a partner at Opticron who have not only helped with donated optics for our raffles for many years but since the last BBF have been giving us major financial support. He’s one of the un-sung good guys who has not only influenced optics development for, coming up to, two decades but is also a champion, through the company, of many conservation projects. Christine has worked for another of our major sponsors, Swarovski, for more than two decades. She says of herself: “I’m not a birdwatcher but enjoy watching wildlife in its natural habitat; the most magnificent sight I have seen was watching condors flying overhead while on holiday in Chile. I’ve toured around the world, but, my favourite place is Interlaken. I love history (especially the mid 1800’s to the mid 1900’s). I’m a member of the Leyton Orient Supporters Club, although I prefer rugby union. I enjoy a game of cricket and as a good Essex Girl I go to the Oval to cheer them on when they play Surrey. I simply love the Olympic Games from start to finish. I’m a bit of a telly addict, watching drama, comedy, quiz shows, the natural world and never miss a dramatization of Dickens, such great stories. I’m also a lifelong fan of The Archers. I also belong to a local pub quiz team”. Charlie Moores and Tristan Reid are another couple of the good guys, unsung heroes of conservation. Charlie doesn’t take the limelight but has had a major part to play in the fight against wildlife crime. Based in Wiltshire, Charlie has been a birder for over forty years. Now freelance, Charlie formerly worked for a major airline travelling extensively and birding continuously (in one memorable year he recorded over 1900 species, raising money for parrot conservation at the same time). Charlie has been writing about conservation and animal welfare issues since the 1990s. 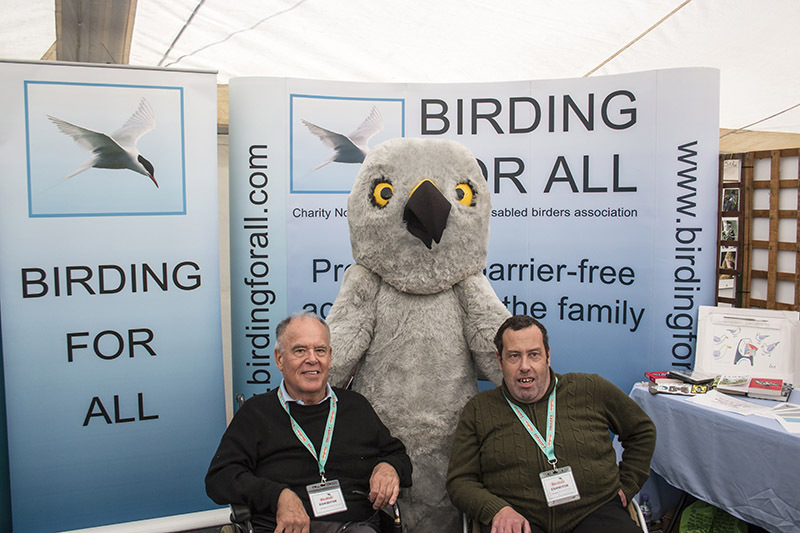 As well as developing BAWC, Charlie co-founded the NGO Birds Korea and is known for his Talking Naturally podcasts recently in association with Rare Bird Alert and Wild Sounds and Books. He has made well over 100 podcasts (currently in association with Lush) interviewing conservationists and researchers around the world. In 2013 Charlie became a trustee of the League Against Cruel Sports. Some of you may know of naturalist and activist Tristan as the Inked Naturalist as he has many tattoos of birds about his person. Based in Cumbria, Tristan has been a birder and naturalist for over thirty years and currently works as a freelance ecologist. Earlier in his career Tristan worked as a nature reserve ranger/naturalist. He is a passionate conservationist and has embarked on some innovative projects to raise funds and awareness for several projects by walking hundreds of miles across Turkey and so forth. He currently sits on the council of Ornithological Society of the Middle East where he helps promote birding and conservation in that region. Tristan is also part of the BAWC admin team and committee. And finally, we are pleased to introduce ornithologist Dawn Balmer. Dawn has been a keen birder since she was a child, and a trained bird ringer for over 20 years. She lives in Thetford (Norfolk) and enjoys local birding and other wildlife, with regular trips to the coast. She has special interests in migration and gull identification. Dawn has worked for the BTO since 1992 on a wide range of census, fieldwork, ringing and online bird recording projects. She was the Atlas Coordinator for the Bird Atlas 2007–11 project and is now Head of Surveys. Dawn also represents BTO on the Rare Breeding Birds Panel. In her spare time, she is on the British Ornithologists’ Union Records Committee, the Editorial Board of British Birds, a Trustee of the Eric Hosking Charitable Trust and writes regularly for British Wildlife. Of course we are always grateful to all our supporting patrons, members and volunteers, and look forward to seeing you all again at the 2017 event. 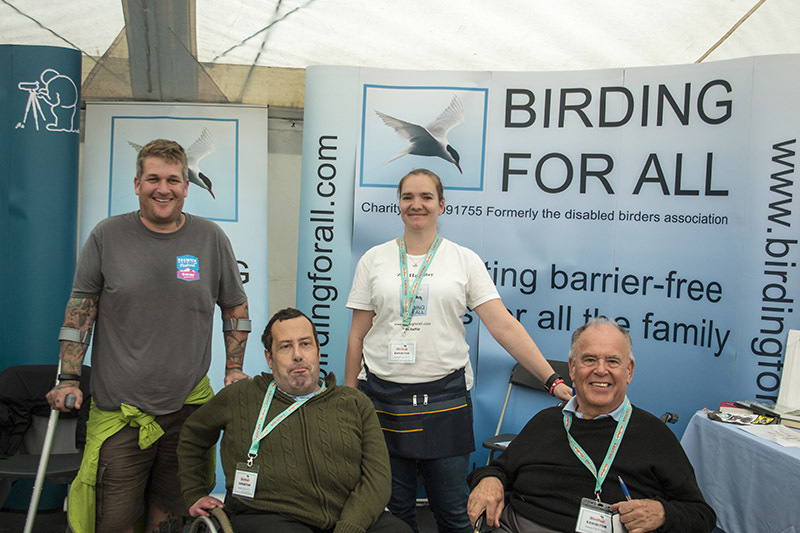 The 2016 British Birdfair was a great event let’s hope 2017 birdfair is as good.